Thanks to Secretary Chuck Hagel’s important visit to South Korea last week, the ROK-US alliance is on firmer footing, at least in the near-term. Hagel and other senior US defense officials spent an unprecedented four days in South Korea, attending ceremonies commemorating the sixtieth anniversary of the mutual defense treaty and ROK Armed Forces Day, presiding over the transfer of command of US Forces Korea (USFK) from General James Thurman to General Curtis Scaparrotti, and exchanging views with senior South Korean officials such as Defense Minister Kim Kwan-jin in their forty-fifth annual security meeting. The visit made evident that South Korean and US officials have made progress in solving several questions that Choi Kang terms ”critical issues of alliance management.” However, they deferred resolution of other topics that, if left unsolved, could still impede transforming the alliance into the more comprehensive and richer partnership that Choi and others have been seeking. The extended deterrence question has gained new prominence due to the considerable angst in the US foreign-policy elite regarding how the budget squabbles in Washington are affecting US credibility and influence abroad, especially in Asia, where Obama had to miss some important multilateral and bilateral meetings to deal with the crisis at home. 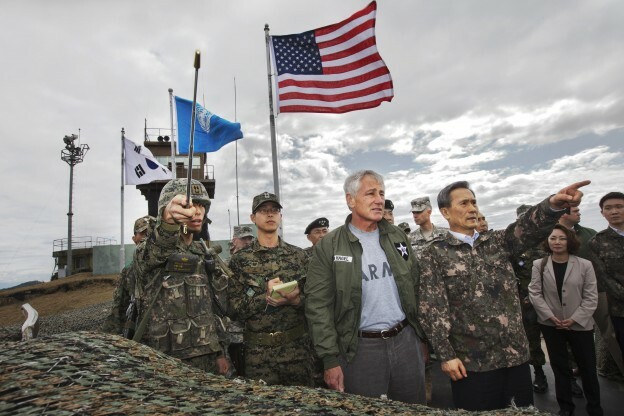 Hagel had to explicitly affirm on several occasions that the United States would keep troop strength in South Korea at 28,500 and continue to upgrade and rehearse its capabilities. To counter South Korean concerns that the Obama administration’s anti-nuclear weapons stance, as a long-term objective, has weakened the credibility of US extended deterrence guarantees in Pyongyang, which conducted another nuclear test in February and is aiming to develop a nuclear warhead that could be launched on its increasingly capable missiles, Hagel also reaffirmed that the United States would employ all US capabilities—conventional and nuclear—to counter the North’s aggression, reinforcing the implicit message made by the deployment of nuclear-capable B-2s in last year’s joint exercises. More concretely, the two sides signed a classified joint document, entitled “Tailored Deterrence Strategy against North Korea Nuclear and other WMD Threats,” which details how South Korea and the United States would respond to North Korea’s growing nuclear and missile capabilities, under various peacetime and wartime scenarios, as well as potential chemical weapons attacks, to ensure “that extended deterrence for the ROK remains credible, capable and enduring.” In perhaps a deliberate attempt to augment North Korean caution, ROK and US officials gave conflicting leaks to the media whether the strategy included preemptive options to prevent an imminent DPRK nuclear strike. Despite regional worries in South Korea and Japan, Pyongyang’s provocations have been constrained in a manner to not directly test US deterrence guarantees. The consultations also addressed the controversial issue of ballistic missile defense (BMD), building on Park Geun-hye’s statement that the two countries would cooperate closely to construct BMD and pre-emptive strike capabilities to render North Korea’s missiles and nuclear weapons “useless.” Although Kim reaffirmed that the Korean Air and Missile Defense (KAMD) system would counter only the DPRK’s low-flying short- and medium-range missiles, the two governments pledged to enhance interoperability between the KAMD and the more comprehensive missile defense network the Pentagon is constructing in East Asia in partnership with Japan and other allies. Park’s references to preemption reflect the two militaries’ view that missile threats should be seen as an interconnected set of processes that begin with sensors and command-and-control systems and end with the actual missile launch and landing. South Korean leaders more openly express interest in developing a “kill chain”—preemptive options for disrupting adversary missiles even before they take off. The South highlighted its new missile capabilities in its military parade earlier this month. The United States is developing its own capabilities for destroying missiles “left of launch,” but does not highlight this effort for fear of alarming China, Russia, and other countries that worry about how the United States might combine preemption and missile defenses to negate their missile deterrents. Following protracted negotiations, the United States accepted the ROK position that it needed the capacity to launch longer-range ballistic and cruise missiles capable of delivering heavier payloads against all of North Korea. ROK negotiators correctly surmised that China and North Korea would criticize the move but not take retaliatory actions since both these states had such capabilities. That said, the missile issue has imparted some tension into the alliance negotiations over their new civil nuclear cooperation agreement—specifically whether South Korea should have the right to enrich uranium and reprocess plutonium. The South Koreans can more easily dismiss US concerns about the reactions of third parties to this weakening of nonproliferation norms by asserting that US worries about relaxing restrictions on ROK missile capabilities did not apparently weaken the Missile Technology Control Regime or overly alarm Pyongyang or Beijing. But US negotiators have to consider a wider range of potential global problems than their ROK counterparts, and need congressional support for the renewed deal. The nuclear cooperation extension remains under negotiation, and has, unfortunately, come to be seen by South Koreans as an issue of trust as well as of nonproliferation. A more pressing issue is the negotiations over the Special Measure Agreement (SMA) that expires this year. According to the most widely cited figures, the ROK government now pays around USD 720 million, or about 40-45 percent, of the estimated direct costs of the US forces in South Korea. The United States wants to raise this proportion to at least 50 percent, while ROK negotiators have proposed adopting an entirely new cost-sharing formula. The main problem with the SMA talks, which have occurred every five years since 1991, when the ROK agreed to cover some of the costs the US military incurred in South Korea, is the difficulty of assessing how much each side should pay and how much they would pay under any agreement, given uncertain future inflation rates and currency fluctuations. The ROK government covers the salary and other personnel costs of the Koreans who work on the bases as well as the construction and maintenance costs for most facilities. But it also forgoes rental revenue by allowing US forces to use the bases, and local communities complain about uncompensated environmental damage and other burdens. Meanwhile, members of Congress can cite reports showing that the share of the costs South Korea, Japan, and other allies have been covering has been declining in recent years. In addition, the United States faces an opportunity cost in that US forces in Korea, unlike those in Japan, do not regularly deploy outside the country. The ROK also does not pay for the expense of sustaining the over-the-horizon US nuclear umbrella and the US forces in Japan that would rush to South Korea’s defense in an emergency. In the end, though, both sides benefit so much from the defense relationship that one has to presume they will reach a mutually acceptable compromise to this issue, as well as the related question of how to share the USD 11 billion cost of relocating US forces from their longstanding bases near the DMZ to new locations further south, Unlike the OPCON and 123 discussions, which have become matters of principle, the SMA and relocation talks remain primarily burden sharing issues that allow for compromises in which each side can fudge the numbers to claim to domestic audiences that it has benefited most. Perhaps, the most disturbing development at the meetings was the evidence of the widening rift regarding when South Korea should recover wartime operational control (OPCON) of its armed forces. For months the new Park government had been giving signals that it wanted to postpone the transfer date yet again. Originally intended to occur in 2008, the present target is December 2015. Meanwhile, some influential members of Congress have been venting their frustrations to the US media that it is time for South Koreans to grow up and take charge of their own defense. At the joint news conference, Kim argued that the conditions had changed radically since the OPCON transfer date was adopted, citing North Korea’s third nuclear test as a major difference. Hagel acknowledged joint concerns about the DPRK’s asymmetric capabilities, including its growing nuclear and missile power as well as its chemical weapons stockpile, and its proliferation activities. He said that the United States would take South Korean concerns “very seriously,” would work with the ROK to address them, would provide specific “bridging capabilities” until South Korea has obtained “full self-defense capabilities,” and would stick to a conditions-based transfer rather than a fixed timetable. In the face of these gaps, the two sides decided to punt—they agreed to establish a panel to study the issue. Although framed as a technical question whether South Korea has sufficient capabilities to counter the DPRK’s offensive threats, the ROK’s OPCON angst reflects deeper worries about how the transfer will snowball into a general US military retreat from the peninsula. The best solution here is probably for the United States to accept the likelihood of delay since forcing the transfer when the ROK leadership opposes it would be counterproductive and unnecessary.